Combining deceptively simple art with clever wordplay, Snail and Worm—told in three comical, episodic shorts and ranging in topic from adventuring to having pets—will have both girls and boys delighting in the friends' silly antics, making it a perfect book for readers transitioning between picture books and chapter books. 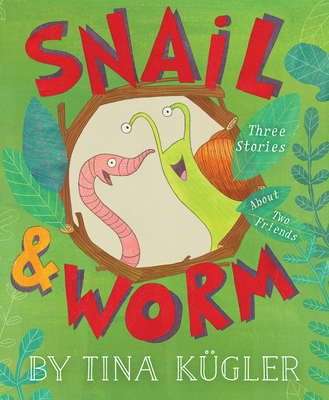 "Snail and Worm’s direct, simplified dialogue is perfect for beginning readers, and their unabashed dopiness—equally evident in their conversations and in Kügler’s mixed-media cartoons—delivers a steady stream of laughs. " "Kügler’s cartoonish creatures, rendered simply in thin lines and soft colors, each have comically googly eyes and cheery expressions, which add plenty of fun visual punchlines and context clues to the short, direct sentences making up the easy-to-read text...The heartening message about accepting a friend’s quirks is a cozy bonus."